I HAD been soooo looking forward to this food fest. I had heard so much about Chef Pauline Gorriceta Banusing from my Ilonggo friends and now, she's at the Mandarin Oriental Makati's Paseo Uno, whipping up wonders in its kitchen for the outlet's Diwalicious Visayas food festival w/c started on Monday, Sept. 19. As I looked over the entire spread of her dishes yesterday, I struggled to contain the panic rising inside me. What do I do? Where do I start? 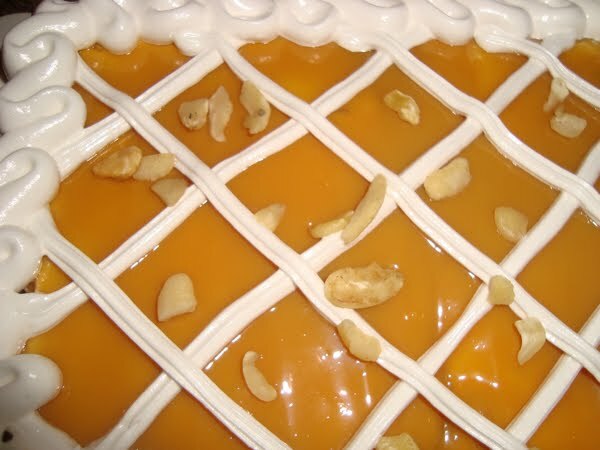 What looks like the best dish to try first? (Sadly, they all did, which made my heart race even faster). But since it was a Diwalicious festival - highlighting the Diwal (angel wings clams) both steamed and w/ baked w/ cheese, I chose that first. Dipped in vinegar with chopped onions, I quickly downed a few of the succulent steamed diwal along with some huge scallops from Roxas City. Sweet, sweet Jesus. I prayed to myself. Thank you for these wonderful gifts from the sea. Kansi - beef short ribs in a sour broth. Then I had a go at Chef Pauline's Kansi - tender beef short ribs in sour broth w/ some veggies – and I was in heaven. Seriously, it was such a divine experience for me just spooning the comforting soup in my mouth, then biting into the oh-so-soft beef w/c just broke down as soon as I chewed on it. I just had to have steamed rice w/ this dish. This was comfort food at its finest. And I swear I could've gone home happy even if I just ate these two dishes alone. 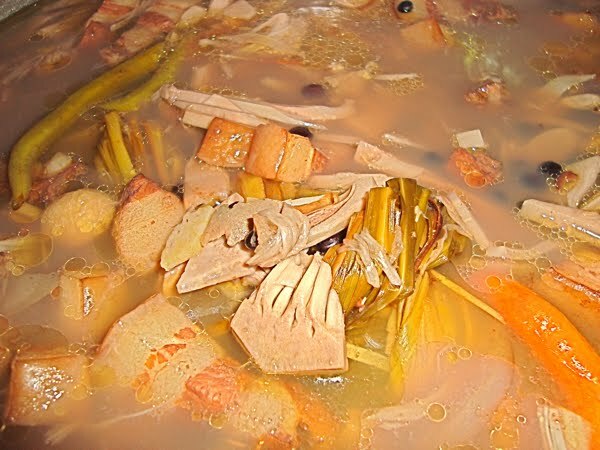 Kansi can be compared to Sinigang na baka except that the souring agent used is the fruit called batuan, which is mostly found in the Visayas, although Chef Pauline says some can also be found in Ilocos and Bohol. Batuan is much more complex than the usual guava or tamarind Tagalogs use for their sinigang. It not only adds sourness to the broth but depth as well. It's difficult to describe it - one must just try it to get what I mean by "depth". Anyhoo, I made Chef Pauline promise to send me her recipe of her kansi so I could replicate it at home. But there was more. I tasted the Pinamalhan na Pink Salmon w/c I actually never had before, but as far as my research goes, is prepared using vinegar, soy sauce, ginger, garlic and a host of other ingredients. It's been described as 'paksiw made dry.' The pink salmon was lusciously tender, but despite the supposedly 'dry' style pinalmahan should be, it was actually masarsa, which I liked. Another soothing treat was the La Paz Batchoy, basically a noodle soup w/ pork innards, and some chicken or pork cuts, with a sprinkling of chicharon and chopped green onions. The broth was just as heartwarming as that of the kansi, only clearer. 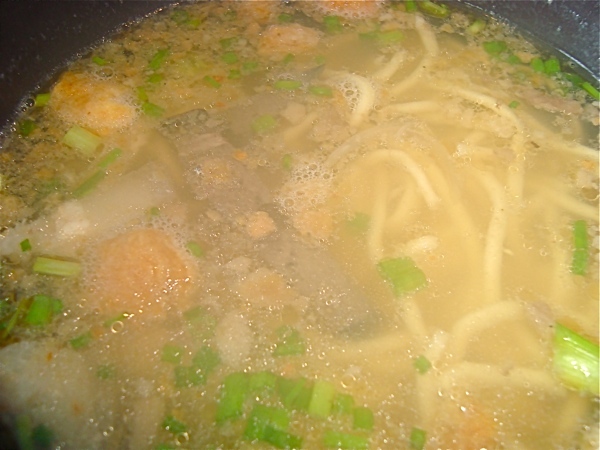 Batchoy could probably be described like Vietnam's ubiquitous Pho, except that even in the Visayas, there are so many styles of how the dish is made although it originated in La Paz, a district in Iloilo. Using fat juicy crabs from Roxas City, Capiz - where my own father's family hails from – Chef Pauline also cooked up some ginataang alimango - I forget now the actual name of the dish. It was sweet, earthy, and quite succulent. Of course, I just had to put down my silverware and used my hands to get to the innermost bits of crab meat, and sucked every tiny bit of morsel I could manage out of the crab's corners. I was just so into it, I completely forgot I was in a five-star hotel's dining outlet. But I just thought it would've been a waste to pretend to be all proper and dainty eating the crabs (I even had a claw cracked open) when there was so much goodness to savor from the crabs. 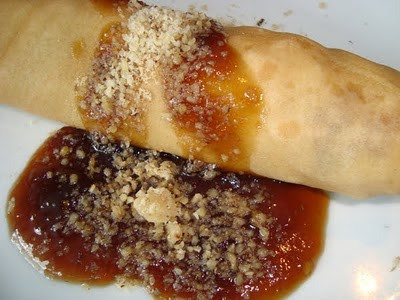 I had two other dishes as well - the chicken inasal and fresh lumpiang ubod – but w/ what I already ate above, I was quite happy...ecstatic even, with the entire experience. And I was quite delighted to see even some Japanese guests at the hotel, savoring each of the the Ilonggo dishes served, instead of concentrating on the usual Western or Oriental portions of the daily buffet. I thought it was so apropos that one of the dishes served was the kansi, bec. I think that it is the best dish that represents how we are as Filipinos - our warmth, open heart, and embracing nature. It is something that foreigners like them would love to experience over and over again. 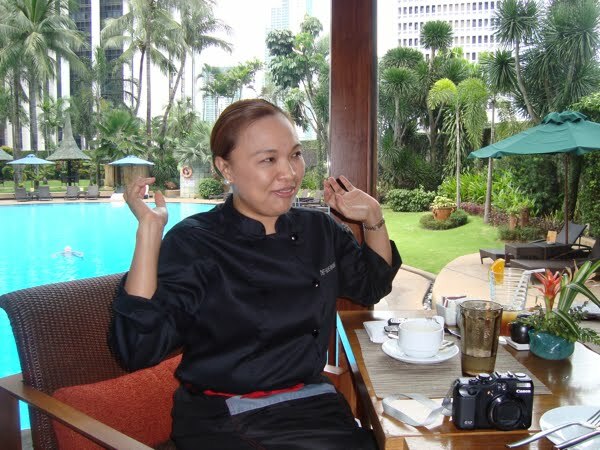 Chef Pauline Gorriceta Banusing, chats with us at lunch. More on Chef Pauline in a future entry. Note: All pics herein are copyrighted by this blogger.